Red Hat Enterprise Virtualization platform supports iSCSI storage by creating a storage domain from a volume group made of pre-existing LUNs. Neither volume groups nor LUNs can be attached to more than one storage domain at a time. Click the New Domain button to open the New Domain window. Use the Data Center drop-down menu to select an data center. Use the drop-down menus to select the Domain Function and the Storage Type. The storage domain types that are not compatible with the chosen domain function are not available. 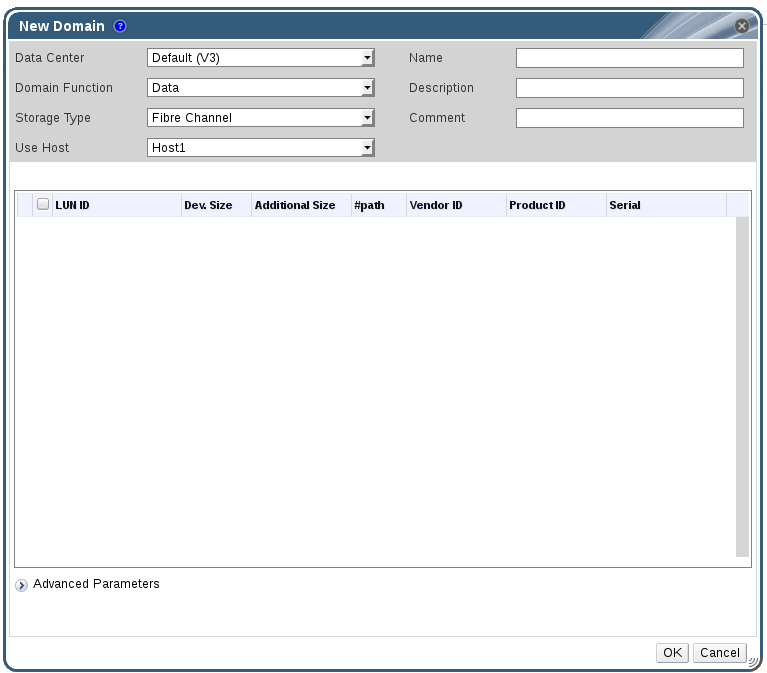 The Red Hat Enterprise Virtualization Manager is able to map either iSCSI targets to LUNs, or LUNs to iSCSI targets. The New Domain window automatically displays known targets with unused LUNs when iSCSI is selected as the storage type. If the target that you are adding storage from is not listed then you can use target discovery to find it, otherwise proceed to the next step. It is now possible to use the REST API to define specific credentials to each iSCSI target per host. See Defining Credentials to an iSCSI Target in the REST API Guide for more information. Click the + button next to the desired target. This will expand the entry and display all unused LUNs attached to the target. If you have configured multiple storage connection paths to the same target, follow the procedure in Section 7.5.2, “Configuring iSCSI Multipathing” to complete iSCSI bonding. The iSCSI Multipathing enables you to create and manage groups of logical networks and iSCSI storage connections. To prevent host downtime due to network path failure, configure multiple network paths between hosts and iSCSI storage. Once configured, the Manager connects each host in the data center to each bonded target via NICs/VLANs related to logical networks of the same iSCSI Bond. You can also specify which networks to use for storage traffic, instead of allowing hosts to route traffic through a default network. This option is only available in the Administration Portal after at least one iSCSI storage domain has been attached to a data center. Click the Data Centers tab and select a data center from the results list. In the details pane, click the iSCSI Multipathing tab. To change a network's Required designation, from the Administration Portal, select a network, click the Cluster tab, and click the Manage Networks button. 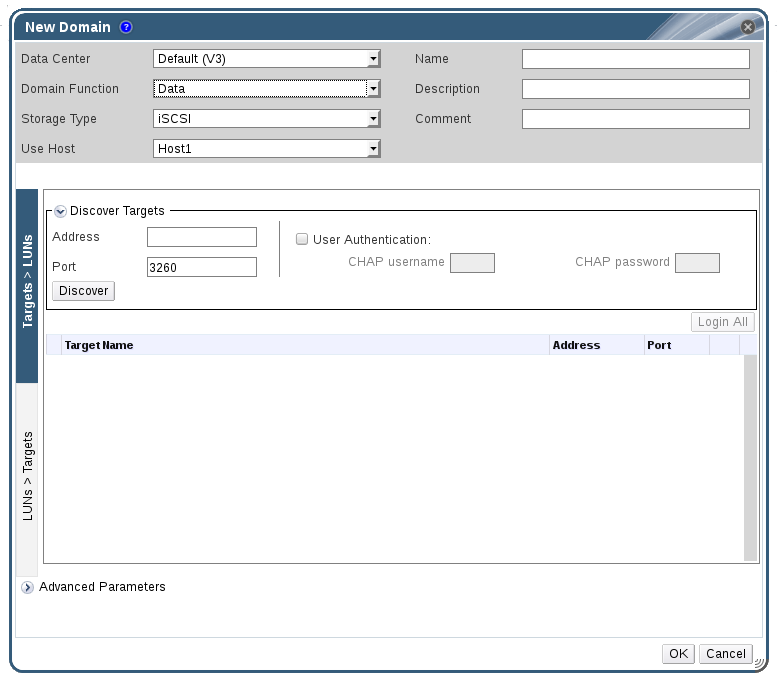 Select the storage domain to be accessed via the chosen networks from the Storage Targets list. Ensure to select all paths to the same target. Red Hat Enterprise Virtualization platform supports SAN storage by creating a storage domain from a volume group made of pre-existing LUNs. Neither volume groups nor LUNs can be attached to more than one storage domain at a time. Red Hat Enterprise Virtualization system administrators need a working knowledge of Storage Area Networks (SAN) concepts. SAN usually uses Fibre Channel Protocol (FCP) for traffic between hosts and shared external storage. For this reason, SAN may occasionally be referred to as FCP storage. The following procedure shows you how to attach existing FCP storage to your Red Hat Enterprise Virtualization environment as a data domain. For more information on other supported storage types, see Chapter 7, Storage. Create a new storage domain with new LUNs and add it to an existing datacenter. See Section 7.5.1, “Adding iSCSI Storage”. Create new LUNs and add them to an existing storage domain. For information about creating, configuring, or resizing iSCSI storage on Red Hat Enterprise Linux 6 systems, see Red Hat Enterprise Linux 6 Storage Administration Guide. For Red Hat Enterprise Linux 7 systems, see Red Hat Enterprise Linux 7 Storage Administration Guide. Create a new LUN on the SAN. 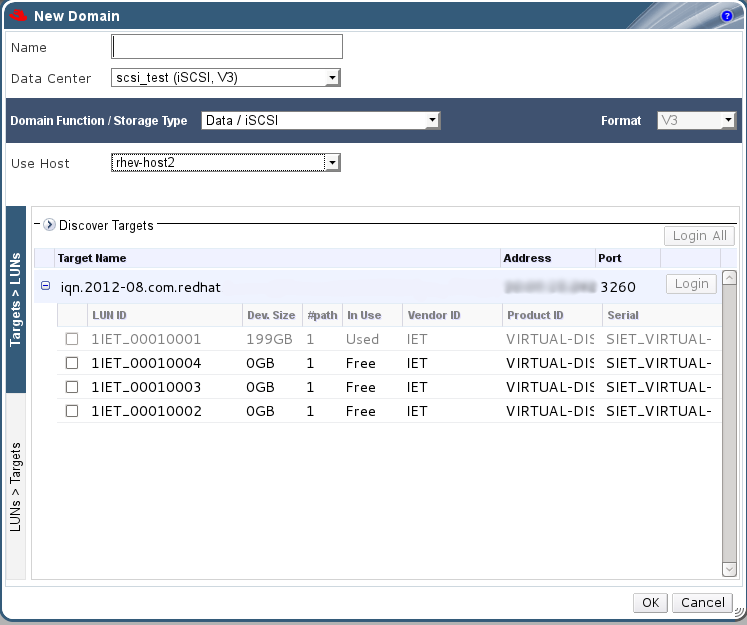 Click the Storage resource tab and select an iSCSI or FCP domain. Click on Targets > LUNs, and click the Discover Targets expansion button. Enter the connection information for the storage server and click the Discover button to initiate the connection. Click on LUNs > Targets and select the check box of the newly available LUN. When expanding the storage domain by resizing the underlying LUNs, the LUNs must also be refreshed in the Red Hat Enterprise Virtualization Administration Portal. In certain circumstances, the Red Hat Enterprise Virtualization Manager will not allow you to use a LUN to create a storage domain or virtual machine hard disk. LUNs that are already part of the current Red Hat Enterprise Virtualization environment are automatically prevented from being used. LUNs that are already being used by the SPM host will also display as in use. You can choose to forcefully over ride the contents of these LUNs, but the operation is not guaranteed to succeed.